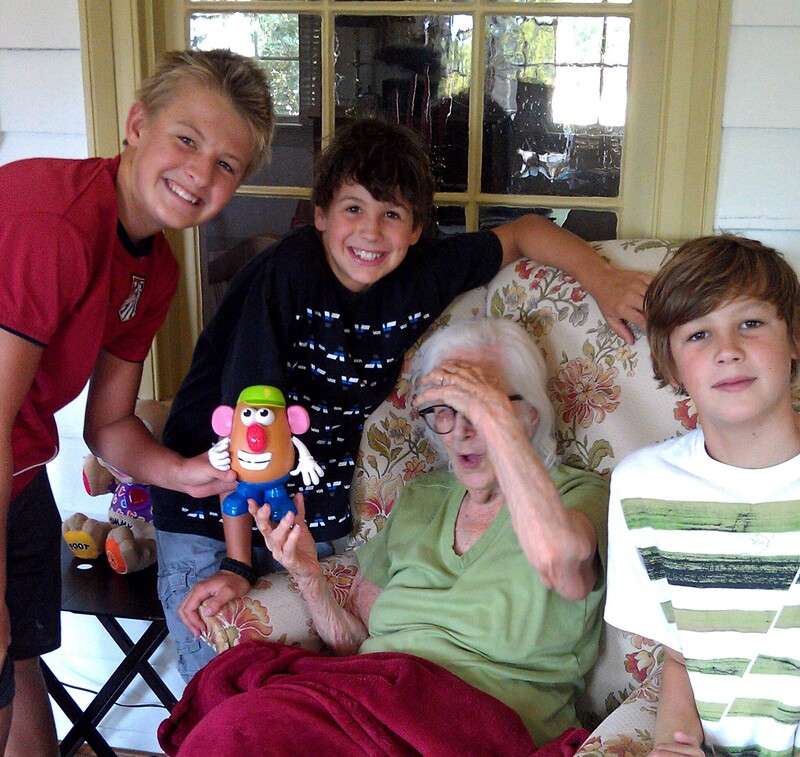 Great Grandboys! Great Grandmom! Great Abomination! Mom’s great grandboys, Thomas, Fisher and Patrick, traveled all the way from their home in Wilmington, North Carolina to Richmond, Virginia to meet the Great Abomination, aka, Mr. Booger Head, aka, Mr. Potato Head. They had heard about how mom just despised the little guy from the very first time she set eyes on him. And, she certainly hadn’t changed her mind when the boys arrived for a visit. If you haven’t read my post on Mr. Booger Head and mom, just click HERE. For the full length movie (2 minutes and 17 seconds), click HERE. When the boys asked mom if I could take a picture of them with Mr. Booger Head (mom’s name for him) she immediately grabbed the Great Abomination (my name for him) from Thomas’s hand and jerked him up and down like he was a martini being shaken-stirred-shaken,-stirred-shaken-stirred. Oh, I could add another descriptive … sliced and diced. The boys response was laughter and that just egged mom on more. Right before their eyes, mom threw one of Mr. Booger Head’s ears high into the air and it fell to the floor accompanied by more laughter. I found myself pulling for the little guy. I had seen that same ear, along with the other one, his nose, mouth, hat, shoes, arms and hands being torn or shaken off by mom so many times, I had lost count. I knew for certain, plastic surgery was just around the corner. I suggested to the boys that we should get a restraining order that wouldn’t allow mom to get any closer than twelve feet of Mr. Booger Head. I thought twelve feet would give mom a chance to yell at him, but not dismember him. After all, sticks and stones were nothing compared to mom’s technique of breaking his bones … and that her words would never hurt him. Especially after being rendered deaf by mom yanking his ears off of his head any chance she could get. The boys had a ball. She got an audience and she got her man, meaning no sooner than I had clicked the picture, she had yanked the eyes right out of Mr. Booger Head’s head. I wish mom hadn’t used that last word. How would you feel if you had just had your eyes yanked out and heard from the yanker a reference to sight. It is just so not right. Restraining order! Could I please get an restraining order! All I am asking for is for twelve feet between my 92 year old mom and the Great Abomination … is that too much to ask? Posted in family, humor, life, love and tagged aging parent, caregiver, caregiving, dementia, elderly parent, Mr. 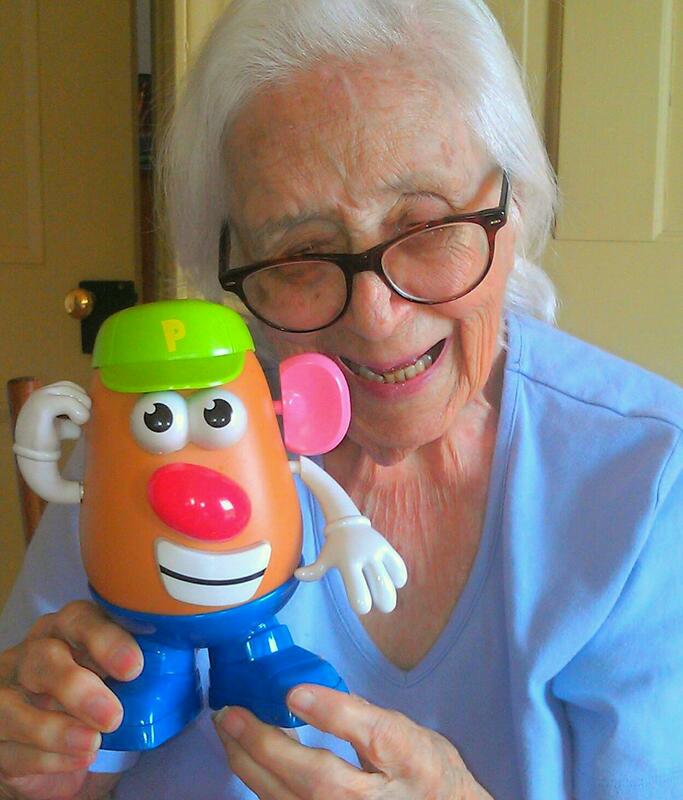 Potato Head, My 91 Year Old Mom. Bookmark the permalink.